Since we started home educating Poppet just over 6 months ago a lot of people have asked how we structure our time, so I thought I’d give an insight into how our days and weeks usually/often/occasionally go! There are different ideas about home education ranging from full-on structured days (very similar to being at school) to complete unschooling, where essentially the learner makes the choice as to what they want to learn, how and when. “What we want to see is the child in pursuit of knowledge, not knowledge in pursuit of the child” George Bernard Shaw. We are somewhere in between the two and this shifts for us depending on how we’re all feeling and what else is going on around us. As I talked about in Black holes… I don’t like to completely prescribe what the girls learn and so they are involved from the outset in deciding what our topic should be and anything they’d like to know about relating to that. I do however feel that the basics (of reading, writing and maths) are extremely important so do aim to do these regularly. 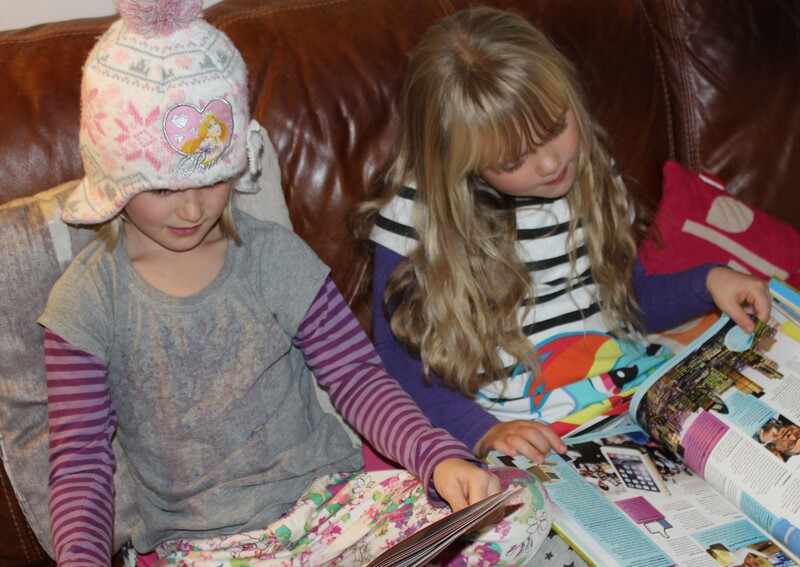 I’m lucky that Poppet and Pickle are both fluent readers so that bit is easy (Right now they are snuggled on the sofa reading together while Piccalilli naps and I write). In terms of writing I like it to be meaningful so we’ve written postcards, letters, diaries, short-stories, shopping lists and more. We don’t sit down and write every day but at least twice a week they are writing something with purpose. With maths things are a bit more structured and we do sit-down maths most days. I have a plan that we follow unless other things come up – for example last month Poppet wanted to learn more about telling the time than just o’clock and half past, so we did loads of time games and activities. As for the other stuff (the other main question I think home educators get asked is “What about socialisation?”) we attend lots of groups and have made many friends. Currently we attend three different social groups, where the kids play and do art and craft activities mainly; occasionally they put on shows as a whole group (around 30 kids ranging from 2 to 14). We also meet up with other home ed families at museums or the park or other days out (You’d be amazed how quiet places are during term time!!) Poppet is also learning the cornet and recorder as part of a band and there are all sorts of opportunities to join other groups all the time. I have to say, if anything, our life is sometimes too hectic! But the best thing about home ed is how flexible it is – if you fancy a duvet day you can, if you want a trip to the beach you can. Anyone up for the beach today? No! Flexibility is my favorite part of homeschooling as well!! Loved reading about what you do.